As promotion for their 2011 release ‘Show Me How To Live’, Danish hard rock/melodic metal band Royal Hunt have released a video for one of their new songs, ‘Another Man Down’, which can be viewed below. ‘Show Me How To Live’ is the band’s eleventh studio album and was released via Frontiers Records in November. The album sees the return of vocalist DC Cooper who found fame with the band in the mid 90s. Chimaira have announced the appointment of their new members. Joining the band on the eve of 2012 are Dirge Within guitarist Matt Szlachta and Daath bassist Jeremy Creamer. The band have also ended 2011 with the release a free remix EP via MultiUpload. The details and download link can be found here. 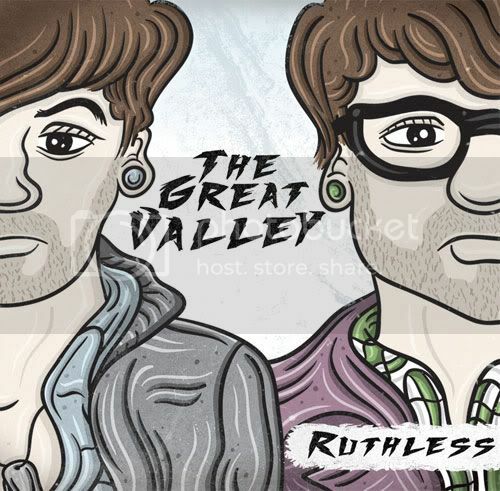 The Great Valley was originally formed as an imaginary band by brothers Louis and Nick Matos when they were 11 and 13 years old. They dreamed of playing music in front of real audiences and like other people with drive and self-belief, The Great Valley eventually became a reality. ‘Ruthless’ is their debut full-length, although the idea of full-length is relative, since this releases eight tracks barely scrape twenty-six minutes. Still, if you’re looking for a bunch of chorus driven numbers which provide more quality than quantity, then this does the job. While the songs are strong, those who dislike the use of auto-tune as a stylistic choice (as per Fall Out Boy, New Found Glory, Relient K and many others) may find themselves struggling to enjoy The Great Valley at first, but if you can make it past that, there are some enjoyable (albeit very similar sounding) songs featured here. By the third track, it becomes possibly to ignore the vocal filters and auto-tune elements – and The Great Valley’s emo-pop-rock starts to get under your skin. ‘Yesterday’s chorus vocals utilise a crowd-pleasing whoah – the kind at the centre of ‘This Is War’ by 30 Seconds To Mars, but unlike those guys, The Great Valley have the good sense not to include them on every song. Combine those with some decent guitar chimes and the album gets off to a good start. The arrangement is as solid as Louis Matos’s drumming style; less auto-tune on his lead voice would have given the track a more organic sound, but such auto-tuning almost seems de rigueur in the world of emo and post-90s pop-punk. ‘Sweeter Side of Life’ is not a great departure from The Great Valley’s previous works, the end result is tight, with another great use of harmony vocals and driving, staccato-ish chords from Nick Matos. Many of these elements are also featured effectively during ‘Like We Do’ – a track which, thanks to a huge hook and elements of angst, create something which stands one of the album’s true gems, despite featuring little in the way of musical variety from anything they’ve offered previously. The title cut is a great slice of sugar-driven pop-punk with a firm emphasis on the pop elements, delivering a sound heavily influenced by New Found Glory (yes, with a similar use of auto-tune throughout). Musically speaking, though, this hits the spot with its crunchy guitar chords and crashy drums providing the heart. The Matos Brothers’ voices blend well throughout, although that’s hardly surprising with the help of studio tweaking; a couple of moments featuring an almost call-and-response style work well. The track is topped by Nick’s slightly spiky but very short guitar solo. ‘Me, Myself & Time’s verses provide a slightly more off-kilter rhythm than some of TGV’s other numbers and also includes a gratifying lead guitar during its intro, but pretty soon, things settle into an all too familiar groove. In spite of this, vocal harmonies, a tough yet bouncy guitar riff and very strong chorus pull together extremely well, in what’s undoubtedly the album’s strongest offering as far as song writing is concerned. It’s a number which could rival Sum 41 at their peak. Despite being very formulaic, and completely lacking in variety after the first couple of numbers, somehow, ‘Ruthless’ still manages to be very agreeable. It really helps that it’s an album loaded with fantastic hooks and solid playing. If you’re a fan of this style of rock, this all leads to a very pleasing experience, but for everyone else, The Great Valley are likely to appear to be dismissed yet another identikit emo/pop-punk package. Indie-pop band Maccabees have released a new video for their track ‘Feel To Follow’ which can be seen below. The track is taken for the band’s forthcoming third full-length release ‘Into The Wild’ which will be released in the UK on January 9th. The album will be promoted with a series of tour dates, the first of which can be seen here. New Chimaira remix EP available FREE! Chimaira have released a new remix EP entitled ‘The Age of Remix Hell’, containing remixes of four tracks from their 2011 release ‘The Age of Hell’. The EP can be downloaded by clicking here.